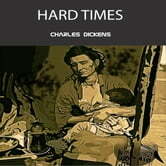 Hard Times Audiobook is the most â€œVictorianâ€ novel among the others by great Charles Dickens. It is the novel where under an external sentimentality there is rough furiousness of the realist writer, to whom imperfection of a human nature and darkness of a human soul are not the news, but still provoke rejection. Friendship and betrayal, love and hate, opposition of the children of the fortune and forgotten men are just some plot lines of the novel. Hard Times is a truly all embracing epochal novel where the history of the whole country and era is depicted in the story of a small town.